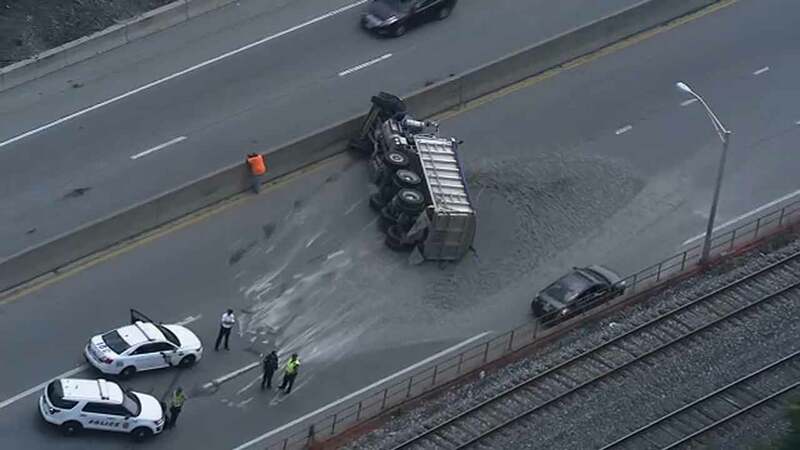 SOUTH PHILADELPHIA (WPVI) -- A crash involving an overturned dump truck slowed traffic for several hours on the Schuylkill Expressway (I-76) in South Philadelphia on Tuesday. It happened after 12:30 p.m. in the eastbound lanes next the Passyunk Ave. on-ramp. Video from Chopper 6 showed a dump truck lying on its side blocking two lanes of the three-lane highway. The truck's load of what appeared to be gravel or gray sand was spread over a wide area. Traffic was affected for several hours as crews worked to clear the scene.